The weather is getting hot these days in Seattle, so I wear a t-shirt to work. 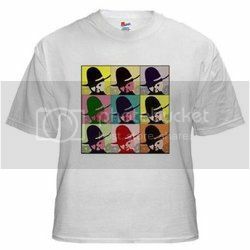 The t-shirt is dark blue with some white picture on top of it. It has a funny icon of doll on it, also the text "We Grease To Please", Quality Guaranteed. Buddy Lee's Gas and Go, and a gas station and a car in front of it. I didn't feel anything special about this tshirt until one afternoon I was on a bus with a coworker, he happened to notice the tshirt and told me, hey, you are wearing a Buddy Lee t-shirt. I responded "what? ", as I never heard of Buddy Lee. Then, he sort of explained that Buddy Lee was a brand from Lee. Buddy Lee (Lee Cano) was an advertising mascot for Lee Jeans. 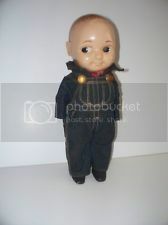 The doll, a promotional item for the company from 1920 to 1962. Sales manager Chester Reynolds who worked for Lee came up with the idea of using a doll to "model" miniature versions of the company's clothes for store displays. The dolls were 12.5" high, initially put onto window display in the company's flagship store. Then, Lee encouraged stores to sell the dolls after the displays were taken down, and later provided the dolls for retail sale, including versions dressed as a cowboy, Coca-Cola deliveryman, railroad worker and gas station attendant. Starting in 1949, Buddy Lee was produced as a 13-inch hard plastic doll. It is interesting to read the history of this obscure tshirt and I am starting to think maybe I should NOT wear it anymore. It certainly looks like a vintage retro t-shirt that I can save and maybe sell it later on. On the other hand, I am pleasantly surprised that my limited aesthetic taste proved correct. When I spotted this t-shirt, I knew I like it. Now there is a reason why, because it is Buddy Lee. 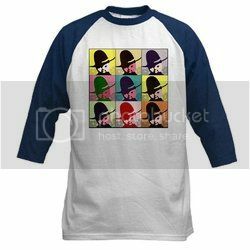 100% heavyweight cotton Baseball Jersey T-Shirt for both men and women, either in the game or just casual-wear. I like this better as the color combination is more compared to the one below. Classic Buddy Lee T-Shirt with clean and simple design. 100% cotton make it very comfortable to wear. So I didn't find the one I had online yet, I will probably take a picture of it and post it here again. ebay has quite some buddy lee dolls available for sale.